There is a misconception among many Hindus that since Hinduism is not a religion in the strictest sense of the word, but a way of life, everything that we do in our lives is acceptable to the religion. This is a simplistic attitude with serious consequences for the future of Hinduism and the values it represents. Hinduism does indicate that human beings are completely responsible for their actions and the paths they chose to lead their lives. It gives them complete freedom to follow their inherent nature and explore their inner world to arrive at the absolute Truth about themselves and their existence. However, this does not mean that it advocates permissiveness or an incorrect way of living. It cautions its adherents to be wary of the illusory nature of our existence and the evils that are hidden in it and suggests several ways and means to deal with it. The scriptures make it amply clear that whoever indulges in wrong actions has to suffer from the consequences of such actions. The epics and the stories from the Puranas convincingly illustrate this fact. They depict how the asuras or demons, who live their lives wrongly and egoistically and indulge in incorrect actions, suffer from divine retribution as well as from the consequences of their evil actions. Repeatedly, they emphasize in many words, through aphorisms, stories and verses, how wrong actions would lead sinful people towards the darkest hells and their moral and spiritual downfall. Therefore, the religious freedom Hinduism offers should not be misconstrued as religious permissiveness. A person who willfully chooses to follow a wrong way of life has to suffer from the consequences of his actions. Religious freedom means living one's life with a great sense of responsibility, not irresponsibility. The responsibility primarily and essentially is towards maintaining and following one's basic Dharma (meaning duty). Your duty comes with your position, status, knowledge, fate and relationships. You have to perform those duties that are obligatory to your position and status in life with sincerity and selflessness. You can only avoid it at a great spiritual cost to you. This is the message which you will find in every major Hindu scripture, including the Bhagavadgita. Hinduism does emphasize that one should live upon earth morally and responsibly according to one's Dharma and the authority of the scriptures. Those who try to rationalize their wrong actions and unethical living do so at their own peril. In this regard there is neither confusion nor contradiction about what the religion stands for and what it upholds. Let us examine how true this assertion is. According to Hinduism every human being, who is an aspect of God, has to live, practice and protect his Dharma or moral and religious laws. If he does not participate in God's work to keep the order and regularity of the world (rtam) and does not protect His Law, he is not entitled to moksha or salvation. Moksha is the highest reward for stepping into the shoes of God and exemplifying Him upon earth. Therefore, each individual has to honor certain duties and obligations towards himself, his family, his ancestors, gods, other humans and living beings. He has a primary duty to serve gods and nourish them because they keep a protective watch over him and help him to secure name, fame, wealth, progeny and other material comforts. In return for their services, the gods need to be nourished because they cannot make their own food. If he does not make them offerings or acknowledge their help, he will not only lose their support and blessings but also morally becomes responsible for their becoming weak and vulnerable against the demons. It does not mean that the gods are selfish, weak, or biased. They exist to keep balance in the worlds between the positive and negative aspects of creation. They are obliged to help you if you follow certain rules and restraints and perform ritual and spiritual sacrifices according to the injunctions of the Vedas. 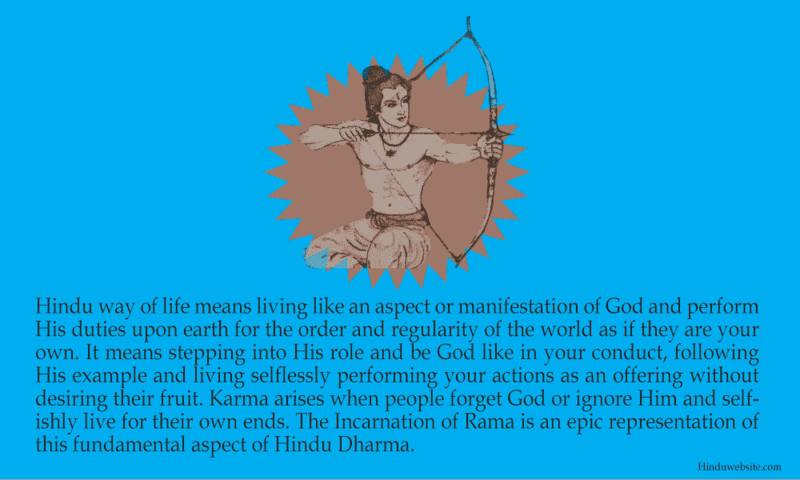 In other words, the gods are impartial, who discharge their respective duties strictly according to the design of creation and the universal laws of Eternal Dharma, as laid down by the Supreme Self, including the law of karma, which means that their response to your devotion and propitiation may depend upon your past deeds. The scriptures are very clear about what should be our attitude towards religious texts, and what we should follow when there is doubt or uncertainty. In Hinduism, an individual must revere and respect the Vedas, because they are revealed by God for the welfare and the guidance of the world and contain nothing but truth. Since we cannot verify transcendental truths with mere intellectual knowledge, we have to depend upon the revelatory scriptures for fact checking. Therefore, it is expected that every devout Hindu should have respect for these sacred books, engage in their proper study and understanding called svadhyaya (self-study) and practice the truths and laws that are prescribed by them. Their knowledge may still be inferior to the self-knowledge, which is achieved through self-realization, but they are important to our spiritual and material welfare. The scriptures also suggest that every human being must live selflessly. He will be responsible for his actions if he lives selfishly, but becomes free if he lives selflessly and without egoism. It means one should cease to exist as an individual to satisfy one's own desires, and learn to see himself or the omnipresence of God in everything and everywhere. He must also believe in his oneness with God and surrender to that idea. As the Upanishads declare, he who sees Him in all and all in Him would lead a deeply religious and spiritual life, because having realized the presence of God in all, he develops compassion and right attitude towards the creation of God. Therefore, a devout Hindu is expected to live his life strictly according to the laws as laid down in the scriptures. He must diligently perform his daily sacrifices, obligatory duties, and various samskaras (sacraments), according to his position and status in society, and live through the four stages of his life (asramas) as prescribed in the scriptures. Unfortunately, many modern Hindus have a poor knowledge of Hinduism, and great contempt for the observation of rituals, which they believe are nothing but acts of superstition and blind faith. They miss the obvious fact that the rituals are meant to inculcate in us feelings of reverence and devotion to God or gods and remember our duties and obligations. The rituals are like milestones along the path of liberation, which remind us that we are on a journey, and our destination is the immortal heaven. A ritual or a sacrifice is a method or a way. When we say that Hinduism is a way of life, we are actually saying that one shall live upon earth as if it is a sacred ritual. The whole process of living is a great ritual, in which each individual offers himself as a sacrificial offering to the divine Self within him to reach the highest state of self-realization. In truth, spiritualism is also a kind of ritualism only, in which the spirit follows a certain prescribed path and returns to its original state. In spiritual liberation, the Self does not change into anything. It just regains its lost consciousness and remembers what it has always been eternally. It is why it is also called self-realization (atma-jnan). The emphasis on rituals in the Vedas is to remind us that we are expected to lead our lives according to a way or a method that would ensure our salvation, and that method is verily the method followed by Brahman Himself, for whom the whole creation is a sacrifice in which He participates as the sacrificer, the sacrificed, the object of sacrifice and the sacrificial host (yajamana). Just as creation is a sacrifice in Hinduism, the life of each individual is a sacrifice. Therefore, you are already participating in a sacrificial ritual called life, in which, like Brahman, you are the sacrificer, the sacrificed, the object of sacrifice and the sacrificial host. From this perspective, demeaning rituals is demeaning your own life and your role as an individual. It is not an exaggeration to say that some degree of ritualism is essential and integral to every religion. Whether it is religion or military activity, management or holding a meeting, rituals add structure and discipline to the human effort. When you greet a person, it is but a ritual. When you celebrate a birthday, it is but a ritual, which is designed to strengthen relationship and value life. Therefore, however superfluous they may appear to the Christianized Hindus, thanks to the numerous, subtle and gross influences, the truth is the rituals of Hinduism prepare us mentally to be part of something greater than us and remain engaged with it. They divert the attention of the otherwise busy individuals from mundane activities and make them god-centered or spirit-centered. It does not mean that we should follow the rituals blindly. Hindus have the freedom to choose their rituals according to their interests and inclinations and their goals (Purusharthas) in life. One can always use discretion in choosing which duties and rituals are necessary for one's material and spiritual Wellbeing. One can formulate a way of life that is in harmony with one's inner being, and values enshrined in the scriptures. One may even formulate one's own rituals, as long as they incorporate the original meaning and serve the same purpose for which they are meant, and discard those that may offend one's own sense of justice. However, it does not mean that the scriptures give a free passage to those who would discard all rituals summarily, and choose a way of life that is similar to that of an atheist or agnostic. One need not have to perform a sacrificial ceremony (yajna) in the elaborate manner as prescribed in the Vedas, if one is dutifully and selflessly engaged in the sacrifice of life. One need not have to perform even the domestic worship (puja) if one has right awareness and attitude towards God and oneself and remains absorbed in the contemplation of God. Rituals can be performed physically or as mentally or in both ways. You do not have to ritually sacrifice animals or offer their blood to propitiate gods. Instead of killing real animals, you can sacrifice the animal tendencies that are present in you to propitiate your inner deities. The Vedas themselves suggest both the approaches and emphasize their importance in the ritual of life. They suggest that mental worship is far superior to physical worship. If one understands the true meaning of a Vedic sacrifice and try to make an offering of something mentally with sincerity and devotion, it will lead to the same results. If one can pray reverently in front of an image of a deity and mentally make offerings with sincerity and devotion, it would lead to the same results as the domestic ritual (puja) performed with the same degree of devotion and sincerity. What is important is the attitude and feeling behind the act of worship, not the ritual of worship itself. The Upanishads caution us against insincere and empty ritualism, and emphasize the need to live in the contemplation of Brahman rather than the ritual worship of gods for material benefits. Many present-day Hindus have a limited understanding of the religious scriptures. Some very educated people among them cannot even recollect with accuracy the names of the four Vedas, or the names of our deities. They do not know what the Upanishads mean and what they teach or might not have read any scripture. They justify their religiosity under the belief that such knowledge is neither essential nor useful for their spiritual progress. Hinduism may be just a way of life, with many choices, and not a dogmatic religion. However, under no circumstances it advocates or approves irreligious, immoral or irresponsible conduct. It always emphasizes the need to protect the Dharma and selflessly participate in God's eternal duties to maintain the order and regularity of the worlds. Your Dharma is not an instruction which is imposed upon you by an institution or religious authority. It is what you are born with. It arises because you are an aspect of Brahman and in some respects Brahman Himself. It is a part of your previous Samskaras. You cannot just wish it away. You practice it because you want to be in harmony with yourself and the world in which you live, not because society or an institution has imposed the code upon you. You are one of the musical notes in the symphony of life, and you cannot sound discordant and disrupt the melody. If you are born with a particular sense of duty and your family or society tries to manipulate you with their own sense of values you have the right and freedom to choose your own, as long as your actions or decisions do not disrupt the social and moral order. This is where Hinduism gives freedom to each individual to live according to their discretion (buddhi). It is where it helps you to break free from conformity, conditioning and the authority of institutions and traditions. The original Vedic texts do not favor rigid social structure. They suggest that one should follow the laws of Dharma according to one's discernment (buddhi). Since discernment depends upon knowledge, intelligence and mental clarity, one should cultivate both physical and mental purity (sattva). Human beings understandably imperfect, since they are subject to the modifications of Nature, and unless they work for their self-transformation through austerities and yoga and bring themselves into harmony with the laws of God, they cannot make spiritual progress. The word "Dharma" has a very comprehensive meaning in Hinduism. In a general sense, Dharma means the Eternal Law, or the Law of God. It also means all the factors that arise out of it and lead ones towards it. Thus, Dharma not only means law or morality, but also duty, obligation, religion, sacred teachings, faith, justice, righteousness, morally actions, righteousness, inherent nature, and so on. Dharma, thus is very intricately intertwined into the very process of living. You cannot separate the two. You cannot say that you practice Dharma only when you visit a temple or read a scripture. You practice it always, as long as you exist, even when are asleep or dead. Therefore, in Hinduism, protecting and upholding one's Dharma is the highest of all duties. Hinduism never says that if Dharma is attacked one should let it go and let the Dharma be destroyed. Even God would not remain silent, if Dharma is threatened or if there is an ascendance of adharma in the world. When Dharma declines, He incarnates to restore Dharma and destroy evil or adharma. The scriptures are clear about this. Life is a battlefield in which a fierce battle rages between the good (Dharma) and the evil (adharma). The same battle goes inside each individual, in the physical and mental planes and in ever organ of the body, except breath (because breath is not subject to willful actions). It is the duty (Dharma) of all human beings who are endowed with intelligence, to protect and guard themselves against evil influences and immoral actions. If they ignore this duty, the law of karma catches up with them and leads them to their downfall. Many Hindus, do not read the sacred texts because of lack of proper knowledge, attitude and faith. They do not perceive any material benefit in reading the scriptures, or reciting them, under the misguided belief that the texts are mere books of rituals and outdated knowledge. Most of them also think one can work for one's salvation, without having to read the scriptures, worship gods, practice religion or live morally. What they do not understand is that nothing is easily attained in this world. If you spend twenty years to get a degree in any subject, imagine how much effort you may require to gain mastery over Self-knowledge. You cannot practice any religion without knowing its scriptures, or practicing its doctrines, values and morality. You cannot attain God, unless you live and act like one, and share His duties in your capacity as an individual. The Vedas are not texts of empty eulogy and ritualism, extolling the virtues of gods and goddesses, who appear more like human beings with the same number of defects as we find in ourselves. They are filled with the wealth of divine wisdom. They contain innumerable secrets, hidden beneath layers of symbolism, which become apparent only to those who have the interest and the inclination, like Shri Aurobindo, to silence their minds and listen with their hearts. Aurobindo did not see mere rituals and gods in the Vedas. He saw in them a deep symbolism alluding to the structure of the universe and is immense gross and subtle powers. Even he did not fully understand their significance, since the human mind has not yet reached that level of purity and perfection to comprehend the transcendental nature of our existence in wakeful state. Many Hindu texts are presently available at reasonable prices all over the world from many sources. One does not lose anything by going through these books and trying to understand what they actually mean. These books definitely help one to gain an insight into the basics of Hindu religion and help one to develop a correct attitude towards one's religion. At least we will be able to know correctly what the right of way of living is. Let us remember that in other religions, scriptures do occupy the central part. These religions are more organized because an understanding of the basic scripture is fundamental to the practice of religion. While there are hundreds of Hindus who have never read a Veda, or Upanishads, it is difficult to come across Christians or Muslims who have never gone through their holy book. Many carry them to their places of work or keep it in their houses for regular or occasional study or reference. It is wrong to presume that Hinduism does not prescribe the study of religious scriptures. In fact, it is an essential and integral part of a person's education and religious life. The purpose of this article is not to advocate blind faith or blind following, but to make the readers understand the need to make right decisions about what is appropriate and necessary to cultivate right faith and practice it according to the scriptures (external Dharma) and one's own essential nature or inherent Dharma. Hindus have the freedom to choose what is right for them, but only according to the approved code of conduct and after careful examination and analysis of their specific spiritual needs and personality types. In doing so they may use their discerning wisdom (buddhi) to know what is right and appropriate in any given situation, without rationalizing their irreligiosity or lack of interest. Let us remember that Hinduism does not prescribe anyway of life, but a way of life which is in harmony with the eternal law of God (Dharma) as prescribed in the religious texts, especially the Vedas and the other sacred literature. It means that one must be conversant with the sacred texts and the essential practice of Hinduism to practice it as a way of life, rather than a mere collection of rituals and spiritual techniques. It is also necessary to have a clear idea of what constitutes superstition and obscurantism, in order to make the way of life free from evil, delusion and negative karmic consequences. In this regard one should never undermine the importance of reading the sacred texts as an exercise in futility. Ignoring them would amount to leading a way of life like a blind man groping in the darkness and accepting it as the universal reality.